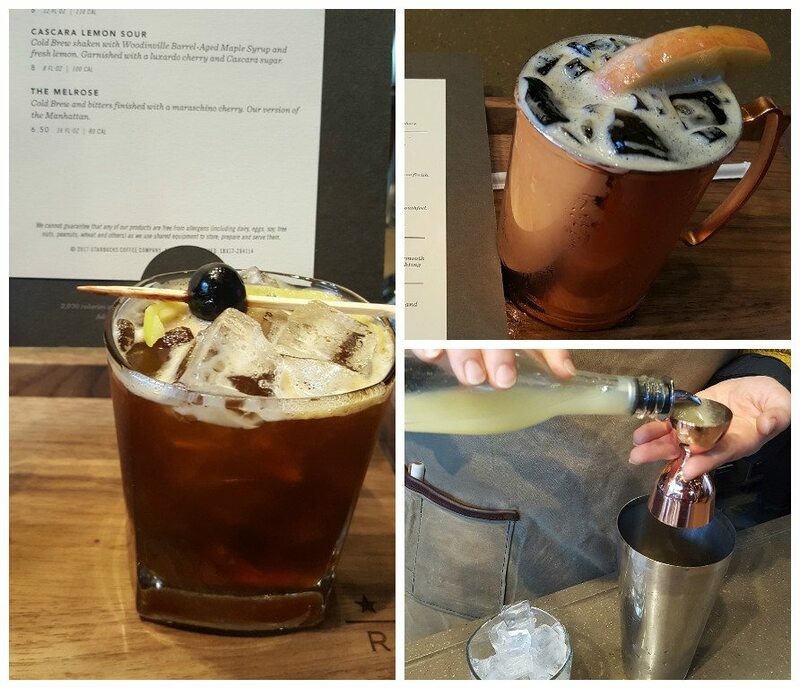 Starting today at the Roastery, the Experience Bar gets its own special menu with some fun mixology cold brew beverages. 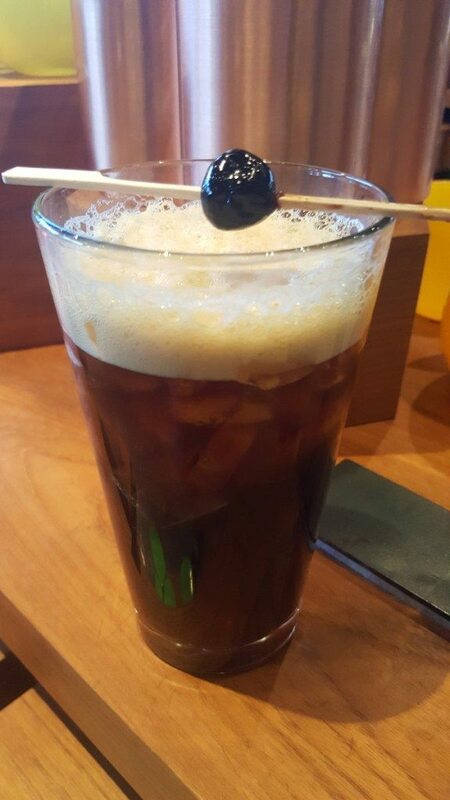 This is a cold brew coffee (the Roastery is using Peru Chontali right now for their cold brew) with freshly-squeezed lemon juice, a whiskey barrel-aged maple syrup, from Woodinville Whiskey Company, garnished with a cherry and Cascara sugar. The cold brew is shaken with the syrup and lemon juice. 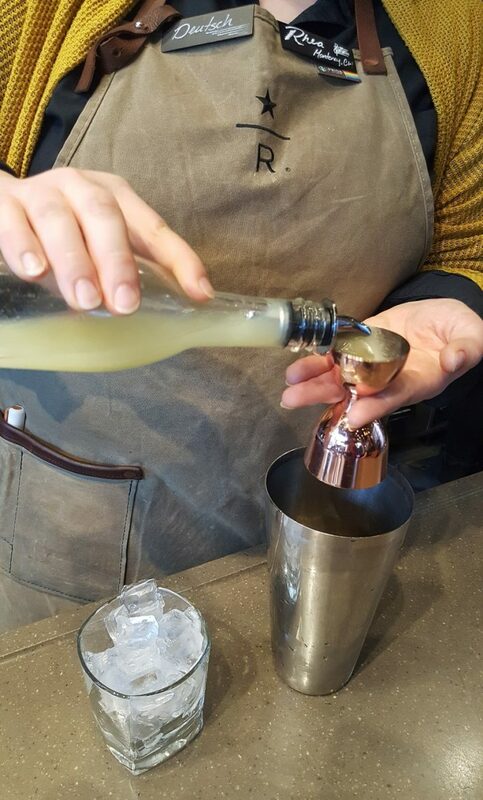 The beverage uses a full ounce of lemon juice so it really has a lot of lemon sour flavor. I asked the barista if this was inspired by creations like a “Coffee Shandy” and “Cold Brew Shandy” and was fairly quickly shot down. Apparently I wasn’t close. 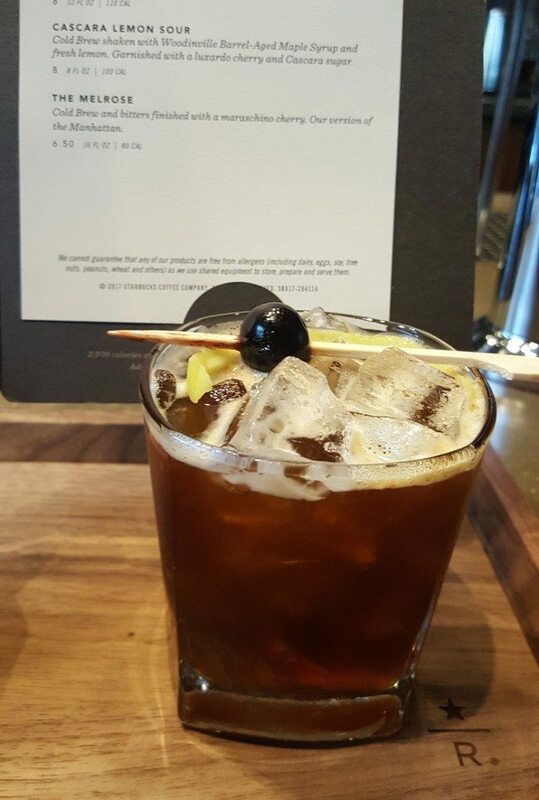 This new “Cascara Lemon Sour” is inspired by the classic mixed drink, the Whiskey Sour. Whether or not it was inspired by an alcoholic beverage, the idea that cold brew and lemonade go together is not new. My only wish for this beverage is that it would be a little more coffee forward. It ends up being pretty sweet. 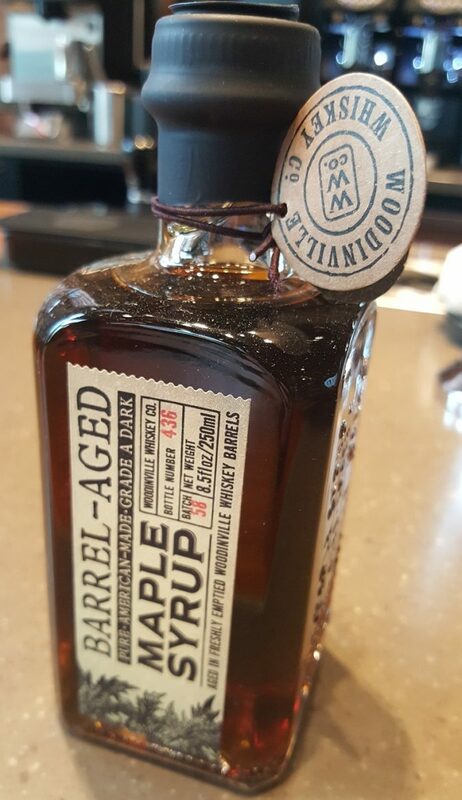 The barrel-aged maple syrup packs a lot of sweetness into a tiny amount of it, and there is natural sweetness to lemon juice too. Still it’s a fun a beverage and would be refreshing on a hot summer night. Next up, I ordered the The Emerald City Mule. The Emerald City Mule is cold brew (again the Peru Chontali cold brew) with ginger ale, and a burnt cinnamon syrup, a small amount of freshly-squeezed lemon juice, and finished with an apple wedge. The menu appears to say that there are “apple slices” but it’s one apple slice, not many apple slices, just so you know. This drink gets only about a half ounce of the lemon juice so it has a lot less sour flavor to it. The cinnamon syrup is strong, and you get a lot of that coming through the drink. Overall, this drink isn’t quite as sweet as the Cascara Lemon Sour. It gets quite a bit of ginger ale as its base. I like this drink too, though again I would prefer a little more of the cold brew flavor shine through the ingredients. However, this is just me and like coffee-forward beverages. I really enjoyed the combination of sweet with cinnamon and coffee. This was my favorite of the two drinks. 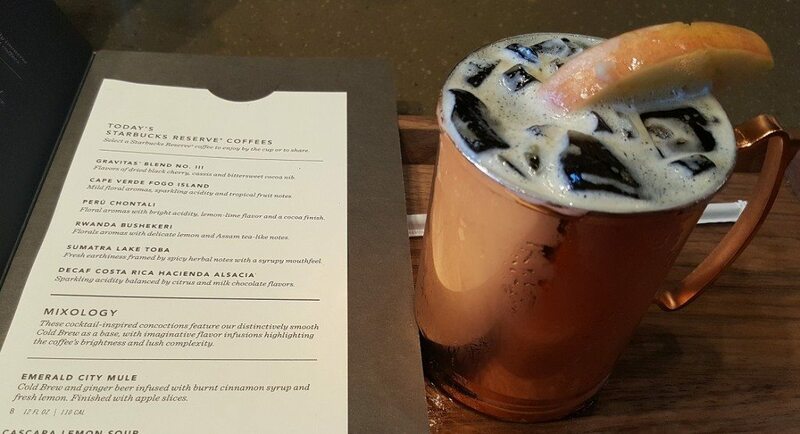 The Emerald City Mule is inspired by the alcoholic drink the Moscow Mule. The two above new mixology drinks are $8 each. 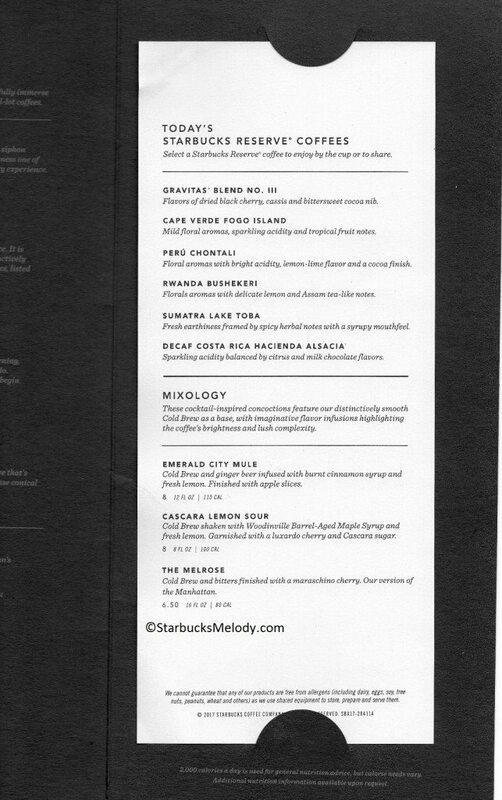 Once in a blue moon, I get asked the question whether I pay for my beverages for my articles here: Yes, indeed. I ordered the above two beverages and paid $17.62 after tax. Of course the experience bar still has the Melrose which has been on the menu for a while. Of the three, the Melrose is my favorite! It’s a sweet cold brew beverage, with lots of cold brew flavor. Limited and unique Roastery totes, now available.